I am a die-hard fan of kale and I like to add these healthful greens in anything and everything. I know for many it’s hard to adapt to its taste and it was true with my family as well. 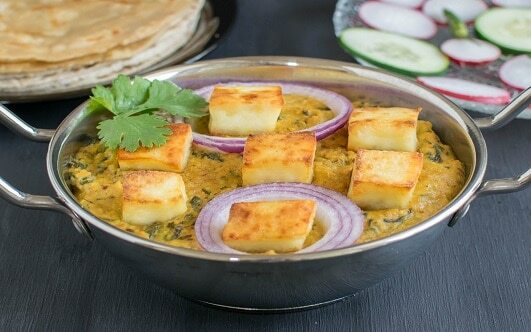 Kale especially in Indian recipes is sometimes not so accepted but this Toasted Paneer Kale Masala broke all the barriers in my home and now my family loves kale as much as I do. Paneer is one the favorite Indian food all over the world and easily available in any Indian store. I try to use homemade paneer most of the time though. To make paneer at home just follow these few simple steps – Bring whole milk to a boil and squeeze 1 or 2 lemons. Lower the flame and keep stirring to avoid burning at the bottom. You will immediately notice the curdled milk. Drain this via cheesecloth and hung it tight in the same cheesecloth. Once properly drained take the paneer out of the cloth and refrigerate for 20 – 30 minutes to stiffen a bit. When ready to use cut into desired pieces and enjoy. I toasted the paneer in the preheated oven instead of frying. It’s healthier and oil free and lighter in the tummy. No babysitting was required as well. While the paneer was getting toasted I prepared the Kale Masala. For Kale Masala I first made a nut paste, sautéed it in minimum oil and added chopped baby kale. I always use baby kale for my recipes because it has a softer and friendly taste and cooks faster without changing the original taste of any recipe. I added some Indian spices and some low fat milk. I never use cream so as to keep the recipe low fat and healthier and avoid saturated fat. This way calories consumed are also in control. Lastly, I added the toasted paneer to it and served with naan and some salad. It goes well with rice and or regular chapatti as well. Preheat oven at 425 degree Fahrenheit and prepare a cookie sheet with a liner and grease it with cooking spray. While the oven is pre heating combine all the ingredients for the paste in a grinder/food processor and grind it smooth. Once the oven is preheated place the paneer sheet pan in the middle rack of the oven and bake for 15 minutes. In the meantime heat oil in a nonstick pan/wok add all spice, cinnamon stick and cardamoms to it. Immediately add the paste to the pan and spread it evenly. Cover and cook for 3-4 minutes. After 4 minutes stir the paste since it may start to stick in the pan add water and mix well. Now take out the paneer after 15 minutes and flip all the pieces and bake again for 10 minutes or until golden brown. Once done take the paneer out of the oven and let it cool. Meanwhile remove the lid of the pan and mix again to make sure the paste does not stick to the pan. Now add turmeric powder, chili powder, coriander powder, cumin powder, dried fenugreek leaves and garam masala and mix very well so the onion paste is well coated with the seasonings. Cover and cook for another 5 minutes. Now remove the cover of the pan again and toss in chopped baby kale. Cook for 3-4 minutes or until kale starts to release its water. Add salt and milk and mix very well. Cover and cook again for 5 minutes. Lastly add paneer to it and mix and cook for 3-4 minutes until paneer absorbs some flavor from the curry. Serve immediately with chapatti/naan and or rice and salad of your choice. If you plan to make to make this recipe ahead of time the curry may thicken. Just add ½ - 1 cup water as per your desired consistency and cook for 2 minutes until few boils and adjust the salt according to taste and serve hot. I would recommend using All Spice for this recipe as it brings a wonderful aroma and flavor to this dish. It’s easily available in all American grocery stores in the spice section. If you buy products from this recipe using below links I get small affiliate commission.